Dr. Goodall Broke Boundaries in Science - Now You Can, Too! You are at:Home»Science & Technology»Dr. Goodall Broke Boundaries in Science – Now You Can, Too! Basecamp 1960s: The sky is inky fabric dotted with stars. The moon is full tonight and reveals a cross stitching of marching ants on the ground. A yellow light flickers from inside the weather-worn tent, and the bugs play offbeat alongside the typing of a typewriter. You’ve entered the world of young Jane Goodall. But how could this feel so real? It’s the most immersive Jane Goodall exploration yet, and it’s available today for free through Oculus’ Breaking Boundaries in Science virtual reality experience! 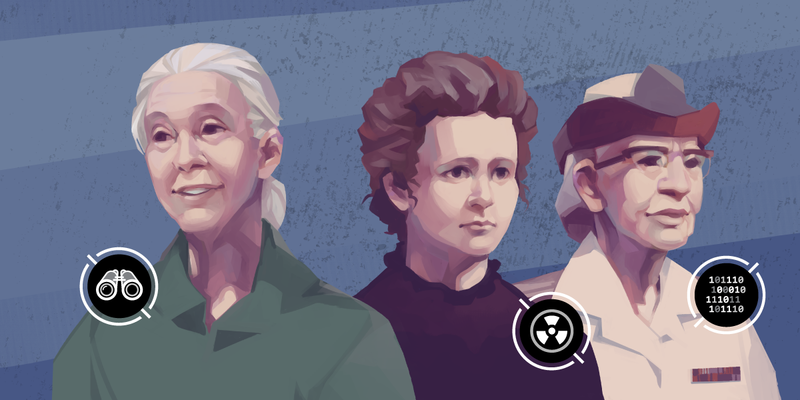 The newest addition to Oculus Go and Gear VR, Breaking Boundaries in Science is a compelling look at the groundbreaking scientific contributions of three incredible women. 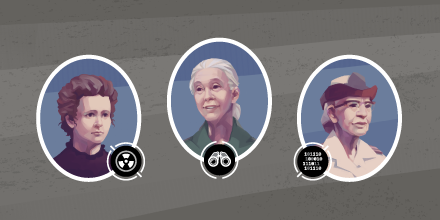 The game includes our very own Dr. Jane Goodall, the famed ethologist and conservationist who transformed the way humans understand our relationship to the rest of the animal kingdom through her research on wild chimpanzees, discovering things like non-human tool use and complex social bonds. Marie Curie, who redefined medicine and scientific research with her discovery of radium, for which she won the first Nobel Prize ever awarded to a woman. And known as “Amazing Grace,” computer scientist and US Navy Rear Admiral Grace Hopper’s work led to the development of COBOL, an early programming language still in use today. Together, these three women live as portraits inside a virtual gallery through which you can step inside their lives, labs and labors to discover even more about these outstanding figures. 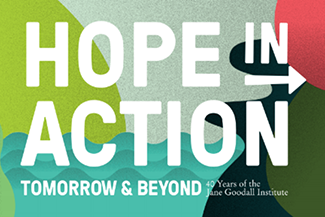 Dr. Goodall’s virtual reality experience is one unlike anything that has been created previously and stands apart from any other journey into Jane’s story that has come before. Players get to explore Jane’s original basecamp from the early 1960’s as it existed in Gombe, Tanzania, created in animation based on real footage and photographs. The camp is complete with key artifacts from Jane’s days of research, items which you will have to find to unlock the full story…The best part: this is only half of the journey! Next stop is Dr. Goodall and JGI’s HQ research center where you can uncover even more about Jane’s legacy of science, how JGI is pushing the boundaries of technology to learn more about chimpanzees and their habitats, and how Jane and JGI are taking conservation to new heights, today. The app is designed and exclusively available for the Oculus Go headset, which makes one other feature particularly striking: Dr. Goodall’s voice overlays the entire experience explaining the key places and items of her work and life for the player! For the curious learner, or the longtime Jane lover, YOU get to #belikejane in this unforgettable virtual reality experience and share Jane and JGI’s story with others. Find the fantastic forests of Gombe in your Oculus Go, and you’ll be pant-hooting alongside chimpanzees just like Jane from anywhere in the world! 1) Get an Oculus Go Headset (or Samsung Gear VR headset) – with no PC or wires attached. 2) Download the Oculus app – with the Oculus app you can download and discover the latest VR games, apps and experiences even when you’re not in VR. Simply connect your Oculus Go and phone to configure and customize your device with ease. 3) Open the Breaking Boundaries in Science experience in the app store (it’s FREE) and start your adventure! Get it here.